Beavers are nocturnal creatures and consequently the best times to see them generally are at dawn and at dusk. Dragonflies, on the other hand, mostly like bright sunlight and they are often most visible during the hottest part of the day. When I was walking around the small pond at Jackson Miles Abbott Wetland Refuge yesterday morning around 10:00, therefore, I was expecting to see dragonflies. Imagine my shock when some motion in the water caught my eye and I spotted a North American Beaver (Castor canadensis) lazily swimming by parallel to the shore on which I was standing. The light on the water was amazing and gave it a golden glow, as you can see in the first image. The beaver made a gentle u-turn and I was able to capture the ripples and the wake it created in the second image. The beaver was then swimming toward the light and that is why you can see some of the details of the eye in that second image. I then decided to switch from my DSLR with my 180mm macro lens that I used for the first two shots to my Canon SX50 superzoom camera. The third image is framed just as it came out of the camera with no cropping and it lets you see some of the texture of the beaver’s fur and the little hairs that stick out of its face. I also love the way the patterns of the water look in this image. This little incident was a reminder to be eternally vigilant. Wild creatures don’t always follow the rules and may turn up in unexpected places at unanticipated times. I have to hand it to you Mike. 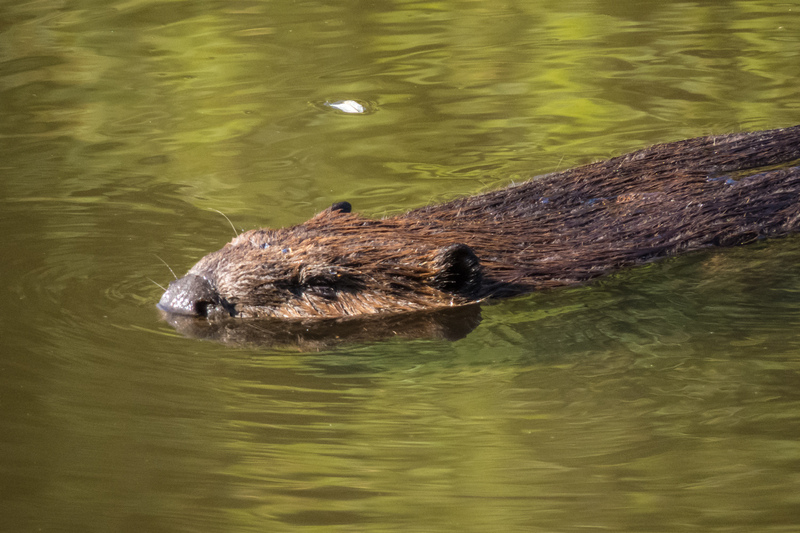 I’ve seen beavers at Great River Park, but I’ve never been able to get the camera pointed and zoomed and focused. Do these guys ever stand still? I have really fond memories of taking those shots, Dan, even though it was quite a while ago. We don’t have beavers, but we have nutria, and it’s rather amazing how much the creatures resemble one another while they’re swimming. On land, the beaver’s much cuter. We don’t have nutrias, though we do have muskrats. 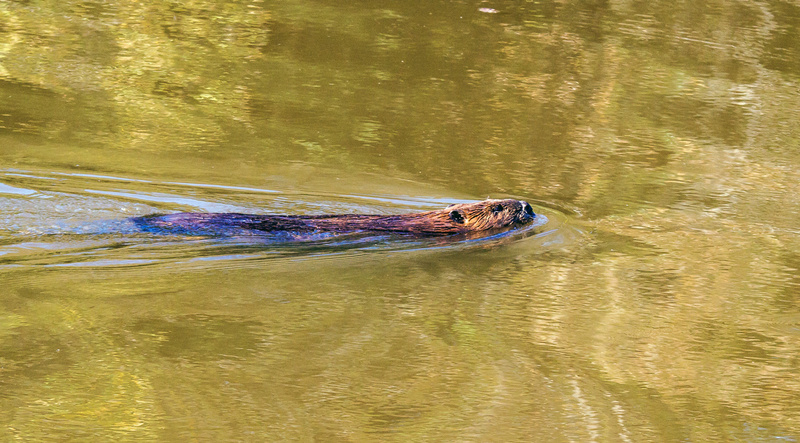 They too look similar when swimming, but the shape of the head is a bit different for a beaver and muskrats swish their rat-like tails when swimming, unlike the beavers that seem to glide. A nice surprise! He seems pretty laid back and not bothered by your presence. I was a little elevated from the water level on a trail around the pond and I think the beaver was unaware of my presence. After a little while, though, the beaver noticed me and dove underwater, emerging a good ways away from me, pretty much out of camera range. They’re smart animals and are hard to get good shots of in my experience, so well done! Fantastic images! 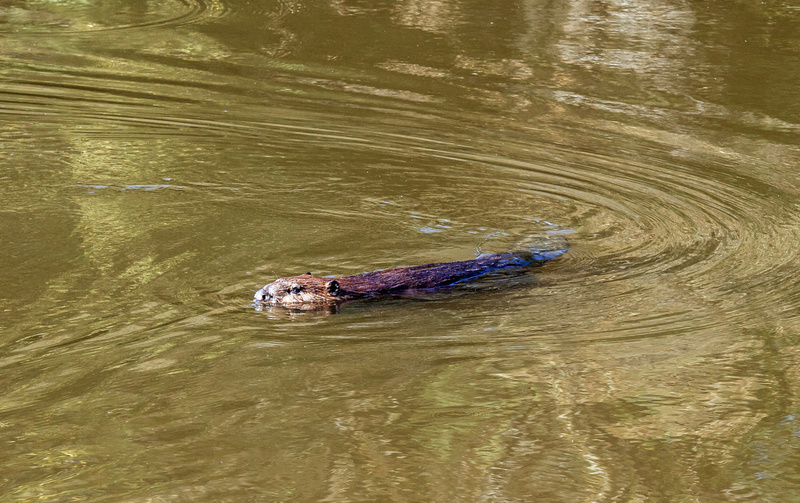 I love beavers, but never see them–only the evidence of their activity everywhere in Seneca Creek State Park. Oh I wish there were some living near us!